Was $391.99 You save $217.00! Give your car's audio system extra bump with these Boss CX122 Subwoofers. Offering a 1400 watt max and a 700 watt RMS per sub, these Boss CX122 subs have a heavy-stamped steel frame, single 4 Ohm voice coils and a custom-tooled injected cone. 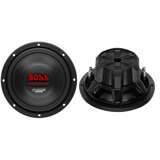 The Boss CX122 subs have a mounting depth of 4-1/8" and are 12". The Boss AR1500M MONO class a/b amplifier features a MAX power of 1500 watts and a RMS power of 700 watts at 4-ohm. Other features include a MOSFET power supply, class A/B circuitry, 2-ohm stable and a low pass crossover. Also, includes a remote bass control. The BOSS AR1500M amplifier is the perfect amp to power your car audio system! Install your car audio right at home with all the right pieces at your fingertips with the Soundstorm 8-Gauge Complete Amplifier Wiring Kit with RCA. The 8 Gauge amplifier installation kit has everything you need to install your amplifier in your car. The amp kit features a 20-foot 8-gauge red power cable, competition high quality fuse holder, 3-feet of 8-gauge black ground cable, 16-feet of 18-gauge blue turn-on wire, a 20-foot high performance RCA interconnect, 30-feet of speaker wire, 6-feet of split loom tubing, 20, 4-inch wire ties, 3, rubber grommets, a Number 10 ring terminal, a 5/16-inch ring terminal, and a 1/4-inch ring terminal. Get more performance with your car audio and get it done yourself with the Soundstorm 8-Gauge Complete Amplifier Wiring Kit with RCA. The 12" Q Power Subwoofer Box is designed and built for the deepest bass. Comes with 5/8" heavy duty MDF construction and 2 sealed chambers. Overall dimensions of the unit come in at 28" W x 12" H x 11 1/2". No complaints as far as recieving my items fast and not damaged. Went to have it professionally installed. So not the sounds I was looking for. I should have known better but was being cheap. I will say for the price and you not really into hard it bass this is a good buy. As for myself I want more so next week I will be changing this out and sticking in garage . I just recieved my license at 18 and I put them in a 78 camaro I've been fixing up. I love them so much.They are better than I could imagine all my friends are so jealous. They came way faster than I originally planned and I didnt have to track them or anything. Vm sent me constant updates on it. Very reliable service very good product. Thank you very much for making it so easy. I give 10 stars.